Moving from A’ha to Action! I was coaching an executive-level client of mine the other day, and he kept sharing these powerful A’has (as I called them) with me throughout our conversation. At first, I was thrilled that he was even present to such valuable insights from his day-to-day interactions with his employees. Before we started the coaching program, he kept himself extremely busy simply handling the organization’s business imperatives and wasn’t able to maintain much of a future focus or think strategically. Since being promoted to President recently, he clearly has shifted his thinking. After I heard a few of these A’has, I then realized that the A’ha is merely the 1st step in the change process. 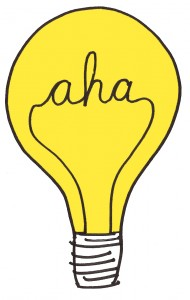 If you don’t take action as a result of the A’ha, then the A’ha will be short-lived as merely an interesting idea. It will never become the catalyst for change that it could – and arguably should – be. So that’s when I asked my client if he was ready to move from A’ha to action. These were very new insights for him, so he hadn’t formulated any plans to move past the insights just yet. That isn’t necessarily a bad thing though. Sometimes, just the A’ha itself is worth celebrating! It’s simply an incomplete process if your intention is to elevate performance across the organization. When you recognize a valuable insight for change, consider what your intended performance improvement really is. Once you have that outcome in mind, you can more easily determine who might be affected by your expected changes. From there, it’s just a matter of sharing the A’ha with this broader group of players and enrolling them in the process of modifying your operating procedures or otherwise adjusting how they manage their work. Change doesn’t have to be a scary thing in this regard. To the contrary, taking action to implement change can actually be quite exciting and exhilarating!